Demolition sites tend to produce a lot of waste and debris. Current legislation and regulations require sites to practice proper waste management in order to encourage recycling and other practices that will protect the environment. This has led to the creation of different waste management tools such as skip bins. Traditional skips are normally open and are available in different sizes, ranging from 2-15 cubic metres. They are primarily used for the storage of general waste which may be bulky or inert materials. Many companies who provide Lake Macquarie with skip bin hire services do not allow certain materials to be stored in them. Materials such as asbestos, electronic, appliances and hazardous substances. Traditional skips can also be utilised for short-term storage of miscellaneous waste. Since these skips do not have any cover, lightweight materials such as paper and plastics should be properly secured to prevent them from being misplaced. 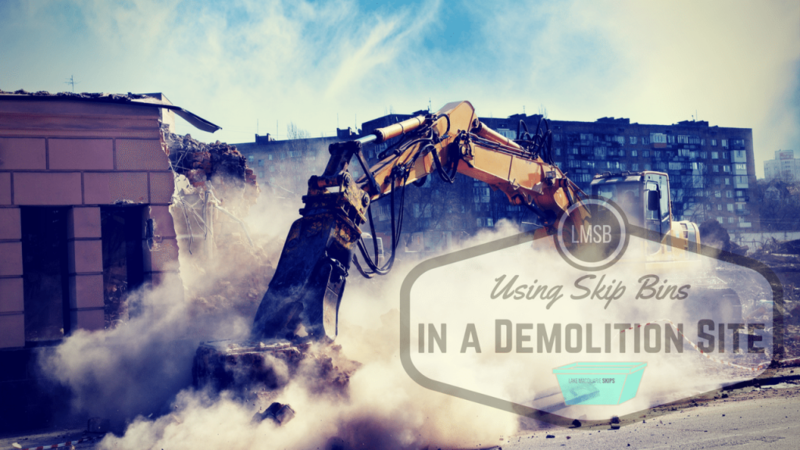 The bins supplied by Lake Macquarie Skips for demolition jobs are usually situated on site. They are then collected by standard skip container vehicles which are manually or automatically loaded. Mini-skip bins with drop down doors are available to reduce manual handling and make loading of skips easier with the use of a wheelbarrow or other equipment for waste handling. Covered skip bins are more preferred to be used during demolition jobs since they are a more secure choice as compared to traditional skip bins. They are completely enclosed and have access doors so the waste materials can be loaded manually. They protect the waste from being contaminated by water and other materials, a feature that is advantageous if the wastes are to be recycled. They are usually used on sites that are environmentally sensitive and where natural factors such as wind may become a problem. Closed bins from Lake Macquarie Skips prevent the lightweight waste materials from being misplaced due to the strong force of the wind. They are also ideally used in places where there are high chances of unauthorised access. The lockable feature of these skip bins significantly reduces material theft. It can also be utilised for the storage of hazardous materials such as bonded asbestos, provided that arrangements are made with an authorised waste carrier. The process of waste demolition can be quite tedious and complex. As such, it is best to get the services of an expert of this field like Lake Macquarie Skips, your No. 1 partner for your waste demolition needs! We are a locally owned company that has gained long years of experience in the waste disposal industry in Lake Macquarie and Hunter Valley. Our customers can attest to our efficient delivery and pick up services, 6 days a week. Enlist our services with the use of our 24/7 online booking system. Our friendly and competent team will ensure that you will be assisted as soon as possible. Call us now!